When I was young, one of my favorite store-bought treats were mandarin oranges packed in light syrup. There was something so special about those tiny slices of citrus that made me smile! As an (ahem) adult, I still receive the same amount of joy when cracking open a jar, only this time around they’re available in pint sized packaging! Wash and peel oranges (reserve peels for making a delicious candied treat), remove any pith or membranes on the fruit and section into slices. If desired (or feeling a bit lazy), they can be kept whole or split into halves. In a medium sauce pot, bring water and sugar to a boil, stirring until sugar is dissolved. 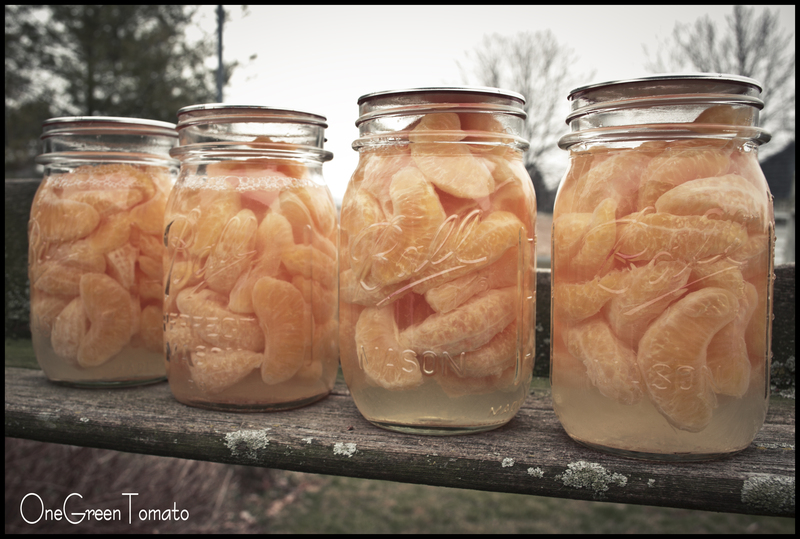 Fill hot, sterilized jars with orange segments (raw pack) and fill with hot syrup, leaving 1/2-inch headspace. Wipe rims and adjust two-piece lids to fingertip-tight. Process pints for 8 minutes at 5 pounds of pressure in a weighted-gauge steam-pressure canner. For a dial-gauge, process pints for 8 minutes at 6 pounds of pressure in a steam-pressure canner. Process in a boiling-water canner for 10 minutes. All processing times are for sea level altitude only. Remove jars from canner and allow to cool, undisturbed, on a wire rack for 12-24 hours. Recipe yields 7 pints. Images and content copyright © 2009-2012 Danielle R Limoge. Recipe from USDA Complete Guide to Home Canning and Preserving.